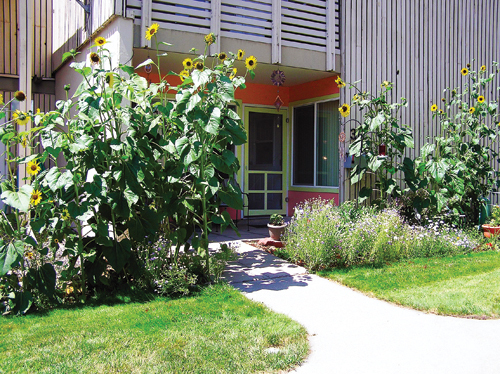 This resident of the Fairfield apartments has grown sunflowers this summer that are providing a bird feeding station, shade and privacy for her porch. Residents of the county-owned apartment complex spoke to the commissioners Monday about needed repairs and maintenance to the complex, including repairs to the east parking lot and painting the exterior. The Fairfield Center is currently being remodeled for additional county offices.